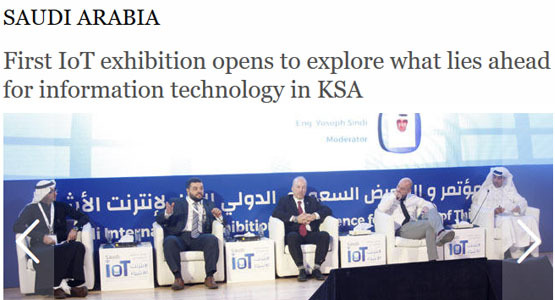 The first Saudi International Exhibition and Conference for Internet of Things (IoT) opened Sunday, representing a major step in supporting Saudi Vision 2030, which has allocated a great deal of support to the IT sector and affirmed full support for creative and innovative thinking to motivate the Saudi youth. This further complements the government plan to expand the broadband Internet services to 70 percent of the remote areas by 2020 and to all citizens subsequently, thus becoming a digital nation with an efficient Internet connectivity, and reaching the cornerstone for the IoT, he added. “This conference and exhibition today started with the aim of introducing and exploring the latest IoT innovations and technologies. For the next three days it will be the place where the techno community will gather to explore what lies ahead for the future IoT industry in Saudi Arabia,” Algarni added. It will also serve as the starting point for lots of deals, negotiations and contracts for better engagements and future collaborations between participating companies. This conference and exhibition will from now on be an annual event with exponential growth, he said. Earlier, Ahmed Sulaiman Al-Rajhi, chairman of the Council of Saudi Chambers (CSC), opened the conference and emphasized in his opening address that anyone can utilize this innovative IoT from using these devices in health care, transportation and communication to other areas of life with immense help for quick data collection, analysis and monitoring in real time. The CSC chairman also stressed that it is useful for a range of purposes such as seeking an appointment with a doctor, calling for an ambulance and for various other daily requirements at a faster pace.